From the Warp: GD 2011 Squad Gold, what is good painting? GD 2011 Squad Gold, what is good painting? As most everyone well knows, this is the squad that won the Gold medal at this year's Chicago Games Day. Let me start by saying it makes me so happy to see this squad win. Not because it's Grey knights, not because of how accurate it may or may not be as it relates to their background, not because of anything else other than it was painted. What? Of course it was, it's a painting contest in case you forgot. Nope, I didn't forget and neither did the judges this year. Now I must confess that I did not go to Games Day so all I have to base my judgement on is what this year's judges tell me is the "best" squad. You see, I'm happy this squad won because of what it's missing just as much as what it has. Confused? Look at the unit. Do they appear to be the hyper-realistic stuff you see out there all the time that people fall head over heals for trying to achieve? Or are these guys painted up (fairly well I might add) in a very professional style? And when I say professional, I'm talking about the level of attention to detail that is given to every little aspect of the models. Nothing is left undone or unfinished. That's why I love them so much. Because they are not the hyper-realistic stuff we see that is elevated and placed on a pedestal as the one thing we should all be striving for. They are painted up in a style that is NOT that. Sure there are elements in there like source lighting and focused highlights, but this unit is painted in a way as to evoke a feeling and not just achieve a photo realism to the painting. I'm glad they won, it makes me smile knowing that there is more out there than the photo realistic approach. Painting a model so it looks "real" is not a bad thing, but it's not the only thing. That's what we need to remember. Painting your models, love to or hate to? Hell yeah Ron! I don't follow the GD circuit, and that unit looks fantastic. I'm also glad to see other styles being accepted. Everytime I see that squad I squeel like a little girl. It's so beautiful and represents the painting style I wish I had. He doesn't grimdark them up with battle damage or make them soar through the air with bullets shooting towards the viewer with plumes of smoke behind, he just paints (some of my favorite models) beautifully. Amen to that Ron. Thanks for posting! James Wappel's NMM is a thing of beauty. It may look "cartoony" to some but the overall effect of an entire model painted that way is that they look profoundly "right." He is truly one of my favorite mini artists. That unit is spectacular! Holy moly, they're awesome. I love the heroic poses and the great highlights...just looking at the models makes me want to try some of those techniques. What is realistic really in 40k minis? Its a style, as if 40k minis are "real". This is the eyecandy style. I like this (although I don't have the skill to paint it). But in the multiverse many others also like the realistic style. One truely good thing about 40k is that is acommodates many styles, no? Could someone give me an example of the hyper-realistic style at work? Are we talking about military miniatures realism? I truly appreciate the fact that he used the older metal models. I think he is a extremely talented painter. He uses both NMM and SENMM techniques along with some minor conversion work. I agree 100% with the "eye candy" comment but overall he achieved the effect he was going for an most importantly, the stye GW looks for. I personally like the hyper-realistic approach but can see how it frustrates some. I wonder if this post isn't geared toward a certain cry baby canadian painter. Excellent post on your part Ron and thank you for saying what many think. Painting models has all the trappings and theory associated with art in general. And yes, painting miniatures is a form of art and so should always be looked at in that way. As with art, and painting in general, there are lots of ways to skin a cat... there are countless painting styles and aesthetics. A photorealistic painting will capture every minute detail of fact. Whilst an abstract painting of he same subject may instead evoke an emotion which places the viewer INTO a scene. That doesn't necessarily make one better than the other... because when judging a painting (or miniature) you are not looking to see how realistic it is... no, that is simply a STYLE of painting... just like Picasso's cubism is a style. No, when looking at whether something is well painted you need to look past a style and assess all manner of things. General things like unity, contrast, rythm and balance are all important to a viewer... and when looking at models there is also the added issues of placing these miniatures in an imagined universe. "what makes any painting good or bad?" Artificer: Yes. I think that this squad won the Gold shows to me that there is something more than just trying to get that hyper-realistic look when painting models. I've never heard of this being called the "eyecandy" style myself, but then again I don't get out too much anymore.I posted this because when I did see the 2011 results, I half expected the Gold to be another squad painted to look "real" and not something like this (eyecandy as you say). I was pleasantly surprised. CoreyHaim8myDog: I'd say that would be an accurate description. Military scale model realism. They are trying to make the model look as life-like as possible. Legion: This post is not geared towards anyone in particular. 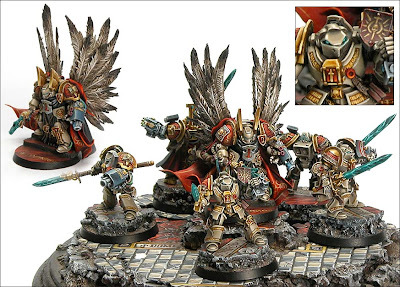 As soon as I saw this picture on the GW site, it (the non-realistic paint style) was something that jumped out to me immediately and I thought it if it jumped out to me, it had to of caught other's attention as well. That's the whole reason for the post. Thanks, Ron. I was out of the hobby for some while. Do you have a link to the hyper-real squads you mentioned? CoreyHaim8myDog: Actually no. It's an impression I have on what people are striving for. I suspect one could go through and look at previous year winners and see if there really is that trend. I see what you mean. In a way, and although I am always impressed by and highly respectful of the crazy stuff you often see on CMON, I prefer tabletop quality. Crazy painted minis feel like they are something nice, but at the same time that thing is not 40k. That is a beautiful squad and it seems like something I could strive for instead of an unattainable standard. Very beautiful.